The global digital respiratory solutions market can reach the value in the range of US$216 million and US$557 million by 2023. There are two main scenarios which define how market players will capture the global respiratory market potential, reaching out to over 500 million patients of chronic respiratory diseases with digital solutions and services. Chronic respiratory diseases, such as asthma and COPD, are global epidemics. With over 500 million individuals affected today, the prevalence of these two major chronic respiratory conditions is expected to increase further. Out of this patient group, about 210 million own a smartphone, a tablet or a smart watch and could therefore be targeted with the help of a digital respiratory service offering. The size of the opportunity is huge and potentially even bigger than the digital diabetes care market. These are some of the findings in the new report “The Global Digital Respiratory Solutions Market 2009-2023: How 500M+ of Asthma and COPD patients are addressed with digital solutions”, recently published by Research2Guidance. The digital respiratory solutions include connected devices (e.g. inhalers or spirometers), mobile apps, additional services (e.g. coaching or training), and clinical portals. At present, no company has yet gained a dominant position in this market, thus representing a business opportunity for a newcomer to enter the respiratory market and gain a significant market share. Today, key players from pharma industry, med-tech companies, and start-ups are strengthening their positions in the digital respiratory solutions market to capture some of its enormous potential in the future. However, they are currently facing several market obstacles that block the growth of its value including e.g. socio-demographic factors, limited HCP acceptance and usage from patients. Pharmaceutical companies are the major driver of the adoption of digital respiratory offerings in the form of connected adherence solutions. Nearly all leading pharma companies are engaged into developing connected inhaler solutions either via partnerships with connected inhaler manufacturers or via direct acquisitions. Their major goal is to protect respiratory device-drug combination products from generic competition and to increase adherence. 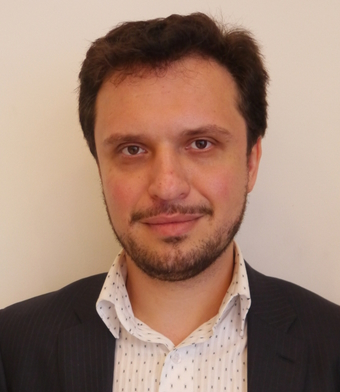 The question of how the market will further develop depends on whether the digital respiratory solution providers will be able to adapt their currently limited digital service offering to best-in-class solutions and services from outside the digital respiratory market, especially from the digital diabetes care and weight loss markets. The market will have to move from mainly selling connected devices and concentrating on adherence solutions to a broader range of services and business models. The ability to learn from other market segments, followed by transforming the digital offering into a companion solution for patients will drive the market’s growth. There are two major scenarios, which describe the market’s evolution. The first scenario is based on the assumption that the digital respiratory solutions market will evolve similar to the digital diabetes market from 2012 onwards. At that time, the market had a similar size and structure as the digital respiratory market has today. 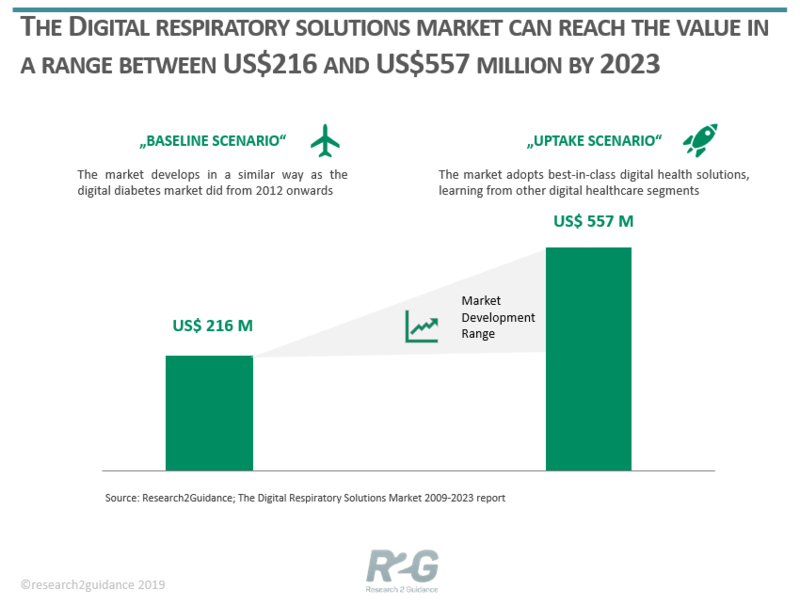 Following this path, the digital respiratory solutions market will grow to US$216 million by the end of 2023 (the baseline scenario). The second market scenario is built upon the fact that the market’s knowledge about what constitutes a successful digital health solution is much more advanced now than it was six years ago. The same is relevant to the technology readiness, the size of investments into the market, and the level of acceptance from consumers and payers. As a consequence, the assumption is that market players will be able to develop their digital offerings much faster to meet best-in-class standards, which will drive the market’s growth. Based on this scenario, the market will be able to reach US$557 million by 2023 (the accelerated uptake scenario). Both scenarios will imply a significant growth path for the market that today offers connected inhalers, spirometers, and some educational services. The Digital Respiratory Solutions Market 2009-2023 report describes in detail the current market status, current digital service offerings and connected devices, service offering and perceived strategies of key market players, key trends, market barriers, and future revenue streams.